The average house price in Spain rose in October – the first time that has happened in any month since 2008, when the crisis started. More evidence that the Spanish house price crash is drawing to a close. The monthly house price index published by Tinsa, a leading appraisal company, reveals that average national house prices rose in October, on an annualised basis, for the first time since 2008. The index rose 0.8% from 1,337 in October 2014, to 1,349 today. The national average was pushed up by a 4.2% increase in the Canaries and the Balearics (the islands), and 3.6% increase on the Mediterranean coast. Prices also rose a fraction in provincial capitals and cities like Barcelona and Madrid, but fell in other urban areas, though not enough to prevent a positive result for the headline figure. Year-to-date (compared to same period last year), the national average is up 0.4%, the coast up 5.6%, and the islands down 2.7%. Peak-to-present, average national house prices are down 41%, the Mediterranean coast down by 47%, and the islands by 29%. 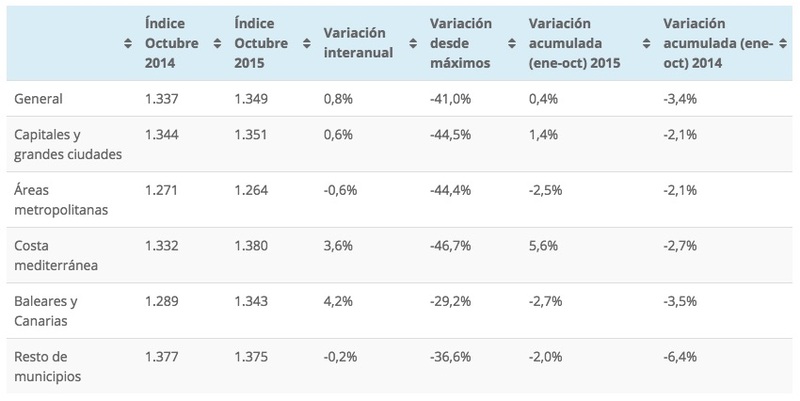 In the context of the SPI house price index tracker, which tracks the seven most important indices in Spain, the Tinsa move into positive territory means that five out of the seven are now in the black. The glaring exception is index published by the General Council of Notaries, which has been trending down for about the last six months, though it is also the most volatile index of the pack. Overall, the picture is one of a market moving towards house price stability after seven years of declines. 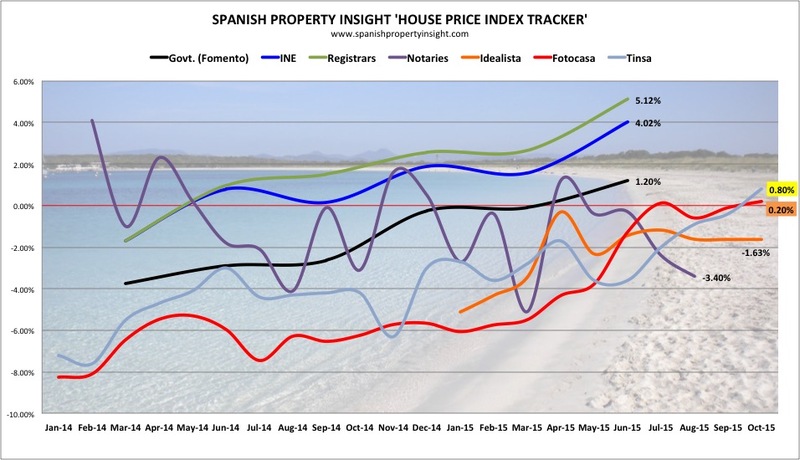 The two latest results are from Tinsa, highlighted in yellow, and Fotocasa’s asking price index, highlighted in orange. do you make updates to this page too? looks like they copy your stuffs. Thanks for letting me know Nicolai. I have never heard of Crystalshore Properties before! 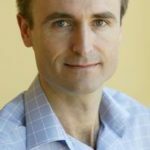 How much of this is driven by foreign buyers? At a national level I would say foreign buyers have a negligible impact on prices, but at a segment level, for instance prime Barcelona or Ibiza, they are the primary drivers of demand and pricing.